My friend, Morgan, is getting married this weekend. At her wedding, she’s going to have a s’mores bar. And what better addition is there for a s’mores bar than homemade marshmallows? So, being the super-awesome friend that I am (snort! 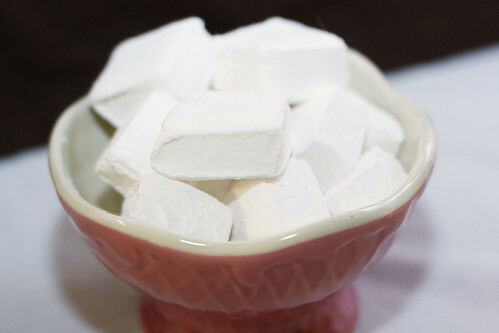 ), I set out to make 150 homemade marshmallows for the event. I started out using this recipe from Smitten Kitchen — it was difficult, and my marshmallows turned out lumpy and not very pretty. That definitely wouldn’t do. I was so glad that I stumbled upon Beantown Baker’s attempt at Alton Brown’s recipe for homemade marshmallows. It was easier and these puppies came out perfect on my first try! 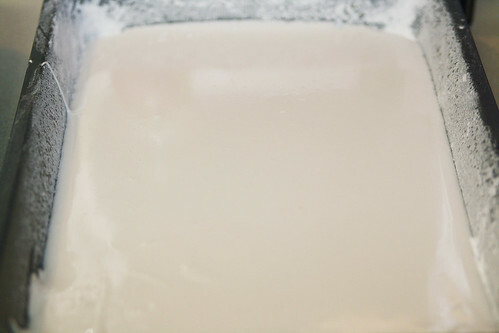 Place the gelatin in the bowl of a stand mixer and pour 1/2 c water on top of it. Let it set. 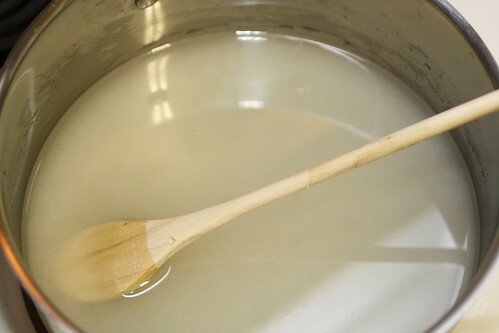 Meanwhile, stir together the rest of the water, granulated sugar, corn syrup and salt in a small saucepan. Cover and place on medium-high heat, cooking for 3 to 4 minutes. 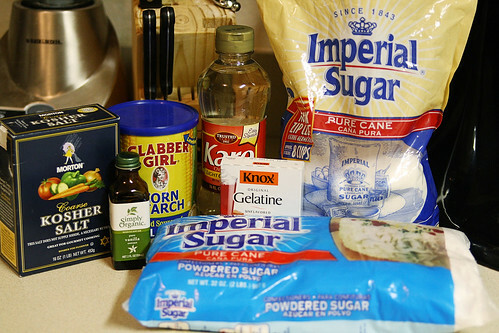 Uncover and cook for 7-8 minutes, until the mixture reaches 240 degrees F.
Turn the mixer on low speed and slowly add the cooked sugar mixture to the gelatin. 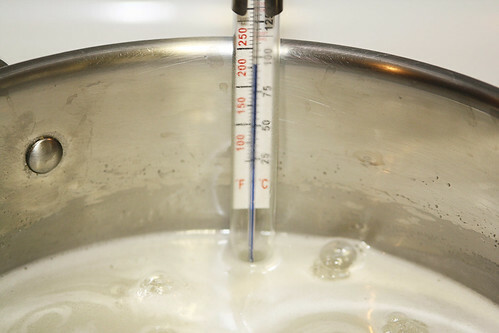 Increase speed to high and beat for 10-12 minutes, until the mixture has turned white and tripled in size. Beat in the vanilla for the last minute. 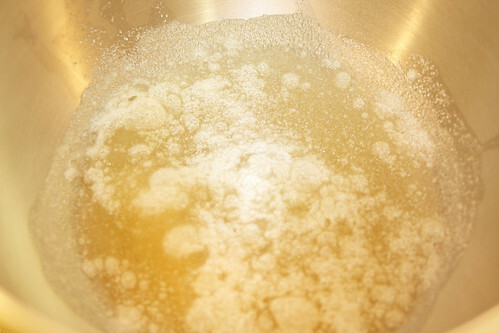 While the mixture is beating, prepare your pan by combining the cornstarch and powdered sugar in a small bowl. Spray a 9 x 13 inch baking pan with non-stick spray and sprinkle the cornstarch/sugar mixture to coat the bottom and sides of the pan. When the mixture is ready, pour it into the prepared pan, using a spatula coated with non-stick spray to smooth the mixture in the pan. Allow to set for at least four hours and up to overnight. Once the marshmallows have set, run a sharp knife along the edges of the pan to release the marshmallow sheet from the sides. Turn the marshmallow onto a cutting board and use a oiled pizza cutter to cut it into 1-inch squares. These are really light and fluffy and will make you never want to buy store-bought marshmallows again. Oh, and be sure to wash all of your pans immediately. This stuff is hard to get off if it sets! 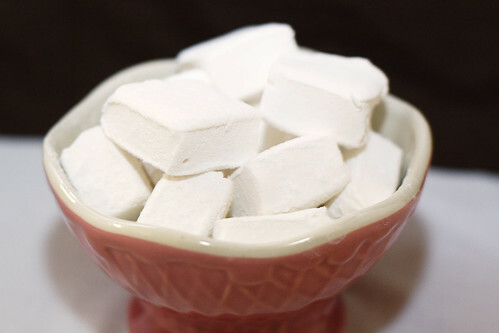 Homemade marshmallows are light, fluffy and perfect for s’mores or hot chocolate!